"If elected, I will push to rewrite NAFTA to protect American workers from greedy multinational interests." Our first president was so revered for his integrity that most believed that even as a child, George Washington could not tell a lie. Can our current president tell the truth? Former Amb. Fred Eckert has filled a 188-page book, "That's a Crock, Barack," with "untrue, duplicitous, arrogant and delusional" things Barack Obama has said. 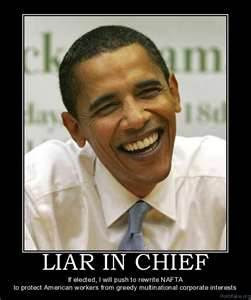 Constant practice has not made Mr. Obama a good liar. A good liar tells plausible lies, lies only when the truth could do him substantial harm. President Obama tells preposterous lies. He lies so often and so obviously about so many things it is doubtful lying for him is merely a tactic. It's an integral part of his character -- or lack of it. A few caveats. Often when we say something that isn't true, we aren't lying, because we think it is true. We are ignorant or careless or both, but we aren't trying to deceive. When a politician says one thing while seeking office, but does the opposite in office, that isn't exactly a lie. Sometimes a new president learns stuff that causes him to alter stances he took during the campaign. This could be why Mr. Obama reneged on his pledge to close the prison at Guantanamo Bay. But when a politician promises "an unprecedented level of openness," and then runs the most secretive administration since Richard Nixon's, mendacity is suspected. Hypocrisy isn't a lie, but it's a close relative. Mr. Obama attacks Mitt Romney for outsourcing jobs. Mr. Obama invests through mutual funds in firms that outsource jobs; accepts contributions from outsourcers and hired an executive who had worked for Mr. Romney's firm as his budget director. An Obama supporter was in charge at that firm when the layoffs the president decries took place, according to Gateway Pundit. Even The Washington Post has criticized Mr. Obama's Bain attacks on Mr. Romney. Many things we thought we knew about Barack Obama are false. Ben Smith of BuzzFeed counted 38 instances in David Maraniss' biography of Mr. Obama in which Mr. Obama had written something false in his memoir "Dreams From My Father." Mr. Maraniss dismisses the falsehoods as literary license. But the British are steamed by Mr. Obama's claim that they tortured his grandfather in Africa during the British colonial era. • Obamacare won't add to the deficit, he said. But according to actuaries for the Centers for Medicare and Medicaid Services, Obamacare will "add about $478 billion in cumulative health spending" through 2021. • Obamacare will "bring down (health insurance) premiums by $2,500 for the typical family," the president said. MIT economist Jonathan Gruber, who helped draft the law, says now Obamacare will increase premiums by 19 percent to 30 percent. • You can keep your private health insurance if you want to, he said. Obamacare may cause 30 percent to 50 percent of private employers to drop their health insurance plans, the management consulting firm McKinsey & Co. estimated last year. A survey in May indicated that 71 of the top 100 companies could drop their health plans. • "If you like your doctor, you can keep your doctor," he said. Post-Obamacare, 83 percent of physicians are considering quitting medicine, according to a survey by the Doctor Patient Medical Association. "Since I've been president, federal spending has risen at the lowest pace in nearly 60 years," Mr. Obama said in May. According to CNSNews, "In fiscal 2009, buoyed in part by the TARP [then-Sen.] Obama voted for and the stimulus he signed, the federal government spent 25.2 percent of GDP -- an increase of 21.2 percent from the year before." Barack Obama often claims "historic" achievements, so perhaps he'll be pleased to be remembered for more than being the president who attended the most fund-raisers and played the most golf. He may be the biggest liar ever to reside at 1600 Pennsylvania Avenue. Jack Kelly is a columnist for the Post-Gazette and The Blade of Toledo, Ohio ([email protected], 412-263-1476).